Lock in a great price for Vasarnica Nr. 17 – rated 8.7 by recent guests! Large room, comfortable bed, teapot in room. No brakfast service but possibility to eat your own food in the garden. Everything was made out of pine and therefore smelled like pine. Very natural. 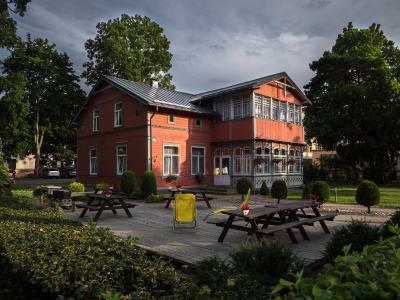 Very welcoming staff, the room was as we expected like in the pictures, the location was amazing, close to everything in Ventspils (beach, restaurants, etc), there was also parking available for free which was most convenient. Enjoyed the hotel's location, the place is great. Recommend. Location is very comfortable, close to everything. Place, room really good. Next to the house very good cafe.I would like to come back. Very good value for money. Perfect for a few nights stay. Best location, near sea and next to the children playground. Very friendly owner, the house is wooden inside and out and smells beautifully. Very cozy. There's no breakfast/cafe but there's one opposite the hotel, very convenient and good prices. The hotel is excellent value for money, well kept and very clean. It's more of a guest house feeling for me with being peaceful and quiet. Outside space has a BBQ that can be used. Huge children's park on the other side of the road. Vasarnica Nr. 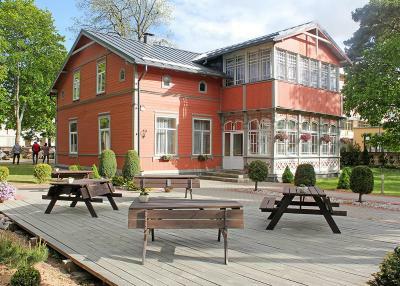 17 is located in Ventspils, 0.6 mi from Ventspils Beach and 1,650 feet from Ventspils University College. Free WiFi is available and free private parking is available on site. Certain rooms feature views of the garden or city. Each room includes a private bathroom. Seaside Open-Air Museum is 1,650 feet from Vasarnica Nr. 17, while Ventspils House of Crafts is 1.1 mi away. This is our guests' favorite part of Ventspils, according to independent reviews. 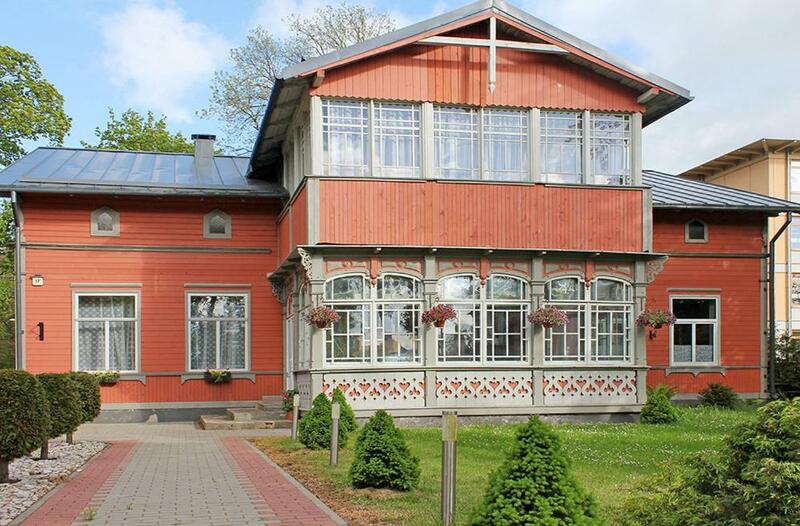 This property also has one of the top-rated locations in Ventspils! Guests are happier about it compared to other properties in the area. 뀐 Located in the top-rated area in Ventspils, this property has an excellent location score of 9.5! When would you like to stay at Vasarnica Nr. 17? House Rules Vasarnica Nr. 17 takes special requests – add in the next step! Please inform Vasarnica Nr. 17 of your expected arrival time in advance. You can use the Special Requests box when booking, or contact the property directly using the contact details in your confirmation. The bathroom was really small and not very clean (probably the bad smell from the pipes made it worser). There was no gel and shampoo (the lady explained that we need to use the hands liquid soap for everything). The room was simple but very cozy, with modern furniture and new bed linen. There was a great cafeteria in front of the hotel. It was located in a very nice street, relatively close to the beach (10-15 minutes walk). On the first floor you can hear everything above and you can hear water running when someone above showers or uses toilet. Also the dark curtains were too transparent and you could see everything trough them. The room could use a little love, the bed were not the most comfortable and the bathroom was not the cleanest. Communication was poor, I received an answer too late, only on my arrival date. Sound isolation is not very good. There were no crib for my little 1,9 years old daughter. We had to move together 3 seperate beds to be sure that our daughter doesn't fall out at the night. Breakfas was not available which is strange for that price. Nearby cafeferia was full already at 9 o'clock so we had to go centre of the city to find some breakfast place. It wasn't so easy as all places open at 10 or even 11 AM on Sundays. Everything else was ok. It would be nice microware and small refridge in the room. The mattress was a bit too firm for my liking. Also, if staying for a few days, note there's no fridge. It would be nice to have something small to keep some food like milk or butter fresh. good comfortable room, excellent place for families with children ( playground, market, cafe, walking distance till seaside nearby). sound isolation could be better. But otherwise stay was very good.